Come experience Cabins USA's premium 5 bedroom cabins in Pigeon Forge and Gatlinburg for your vacation in the Smoky Mountains! These comfortable rentals come complete with jacuzzis, hot tubs, pool tables, and decks with mountain views to make your stay truly unforgettable. Reserve a cabin today to save 15% on your nightly rate! 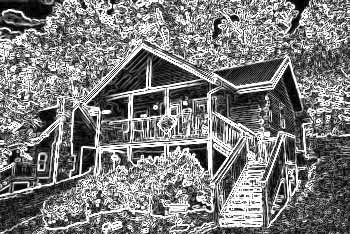 Cabins USA offers 5 bedroom Pigeon Forge, TN cabins for family reunions, weddings, business retreats, or other group gatherings. With convenient locations and comfortable interiors, these 5 bedroom cabins in Pigeon Forge provide everything you'll need for memorable family vacation. There's plenty of attractions around our family cabin getaways. From the Pigeon Forge Parkway with it's various mini-golf courses, family fun parks, and shopping, gives families the chance for endless excitement on their vacation to the Smoky Mountains. The excitement continues in Gatlinburg with delicious restaurants and more fun-filled attractions. Families looking to reconnect with nature will love going through the most visited national park in the country – The Great Smoky Mountains National Park. Back inside your cabin, there's space to keep the action going with spacious living rooms and game rooms complete with exciting arcade games, pool tables, and more. Spacious kitchens allow you and your family to enjoy each other's company around the dinner table and enjoy a delicious, cost-saving meal in your cabin. Other features such as hot tubs allow you and your family to unwind and relax on your vacation. Practical amenities such as washer and dryers allow you to enjoy your vacation with ease. Need a slightly smaller family cabin in Pigeon Forge? In addition to five bedroom cabins in Pigeon Forge, Cabins USA also features several three and four bedroom cabins for rent . These cabins come with the same amenities and features as our 5 bedroom cabins – just with fewer bedrooms and a lower price! Find the perfect cabin to fit your family vacation today. Book your 5 bedroom Pigeon Forge cabin rental online with Cabins USA and SAVE 15% immediately! If you have questions or special needs, please inform your cabin rental reservationist while booking your group accommodations in the beautiful Tennessee Smoky Mountains.